The Strip Tube Ruler.. My favorite ruler ever! Hello! My name is Daniela Stout and I am thrilled to be part of this month long cutting event with Moda. 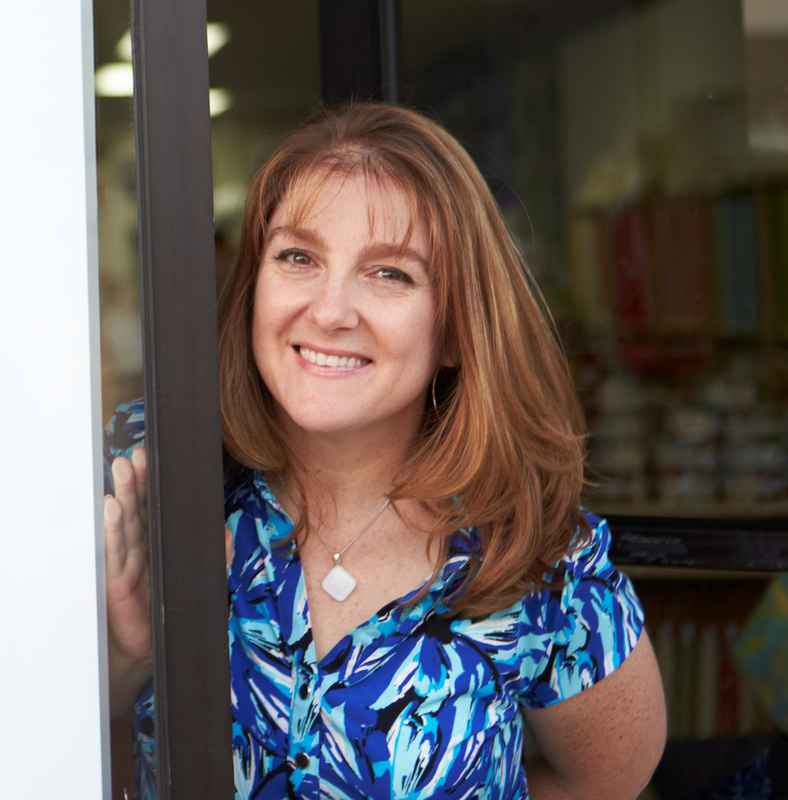 I own Cozy Quilt Shop (which is outside San Diego, CA) and Cozy Quilt Designs (a pattern, book and ruler publishing company.) And I love strips! Today I want to show you the most brilliantly simple invention that makes quick work of strips, turning them into gorgeous blocks in no time at all. We call it the Strip Tube Ruler and my mom made me do it. Quick sidebar: It’s true… my mom made me do this. When we started writing patterns for 2½” strips we used this tube technique with a square up ruler. Then one day my mom (and then primary sample maker) said we should create a ruler to make it easier. Naturally, I ignored her. (Just like your kid, huh?) But then a customer said the same thing! Then my husband made us a prototype, found a company here in the States to make it, and a best-selling item was born. Now.. back to the ruler. How does it work, you ask? It’s easy.. .and sooo versatile! Today, I am going to quickly show you just one way to use it. First. 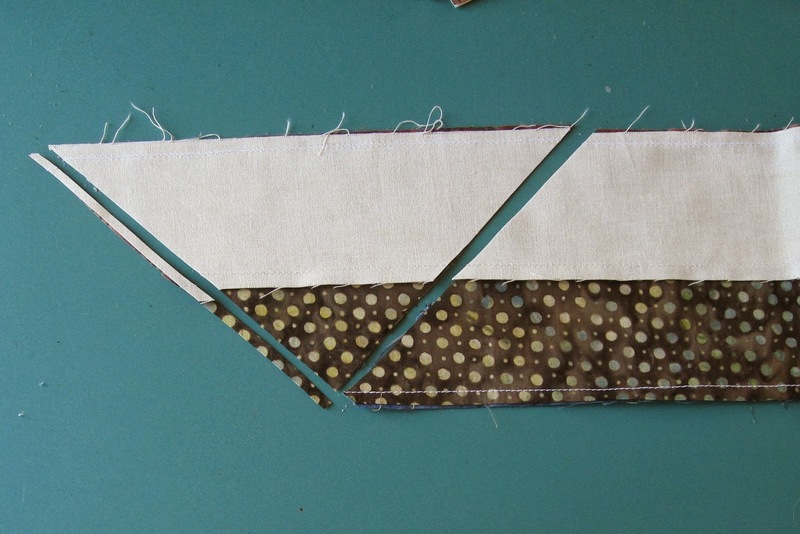 Sew two 2½” print strips together (a “print strip” is a strip from a bundle like a Jelly Roll). Press the seam in one direction. Next sew a print strip to a 2½” background strip to make another set. Again, press in one direction, preferably to the dark. Place the 5½” line of the Strip Tube Ruler on the bottom STITCHING line. Cut up and down to cut out a triangle. 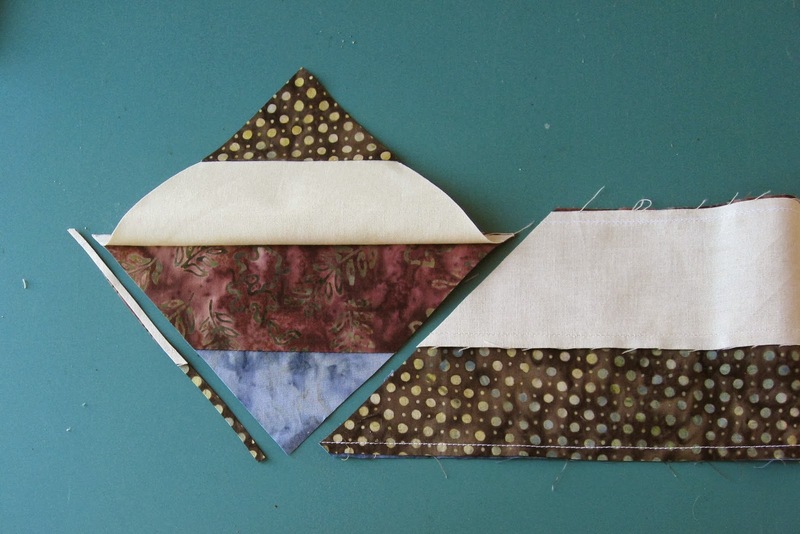 Now pull the triangle away from your tube and open to reveal a diagonally pieced square that measures 5½” square. BRILLIANT! Next time you cut, place the ruler on the top stitching line (make fresh cuts) to reveal another triangle that opens to a perfect 5½” square! You see how this goes… continue down your strip to cut out a bunch of triangles that open to perfect squares… making fresh cuts, now. Notice the fabrics are the same but in different placements? Sort them into two piles as pictured. Now… let’s see how it looks when you put 40 strips, some background and the tube technique all together using this technique. Do you love it? Do you want the pattern? Well! I invite you to subscribe to my eNewsletter and you can have this pattern I call Strip It Tube It for FREE! Click here to subscribe. So in this sample we used the 4½” measurement, but The Strip Tube Ruler goes up to 9½”… so you can just imagine the possibilities are endless. And for more ideas check out these other patterns by Cozy Quilt Designs that use the tube technique with 2½” strips. Need more inspiration? Come visit our Strip Tubing feature page and meet the baby brother, Strip Tube Junior. Now if you are still reading this, you get bonus information! On our Strip Tubing feature page is a link to “The Chart”… this handy pdf will tell you how you can use this technique to cut out regular half square triangles!! Sweet stuff. And if you want to make your own designs, it will tell you what size tube to make! So hey, one more thing… if you like videos, visit our YouTube Channel to see me in action. I debut a Strip Pattern a month… And many of them use the tube technique! I will be giving away one of these wonderful rulers to one lucky winner! To enter please leave a comment telling me your favorite Cozy Quilt Designs pattern. Feel free to use one I mentioned or pictured in this post or maybe you even have a favorite in your own library. You will have until September 30th (That’s TODAY!) at midnight to comment. All winners will be randomly selected and announced on Moda…The Cutting Table Blog on October 2nd. By Guest BloggerIn NotionsTagged Cozy Quilt Designs, Favorite Notions, Measure Twice Cut Once, national sewing month, Rulers, Strip Tube Ruler276 Comments on The Strip Tube Ruler.. My favorite ruler ever! Previous Previous post: Time to TWIST! Paradise Found looks pretty great! I would love that in my house! Thanks for a chance to win! Lotus Blossom is a good-looking one! Thanks for the giveaway. I have always liked the Tradewinds patterns but I think my new favorite has to be Timber! So cute! Thanks for the giveaway. Just a note – I signed up for your newsletter and the free pattern was Beachcomber, not the strip it tube it pattern. “Festivities” is one pattern that really appeals to me! My favorite Cozy Quilt Designs pattern is Intertwined. I’ve been interested in the Strip Tube Ruler for some time but didn’t realize how many pattern options there were. Can’t wait to try it out! Paradise Found is my favorite pattern. Tropics is absolutely gorgeous – what a fab ruler and the tube idea is genius!!! What a great ruler! My favorite pattern is Festivities! I love the colors and the way the pattern flows! Thanks for a great giveaway! Love the Butterfly Blooms pattern. This is so clever!! I love the concept and the samples are all gorgeous. My favorite pattern is the Parallel Universe – so pretty! I have the Tradewinds pattern and am ready with a killer set of batik strips. Thanks for sharing! And for your helpful tuts. Thanks for the great tutorial – I have a strip ruler in my sewing room just waiting to be put to work! Easy piecing — that’s Me !! I just love Parallel Universe… Thanks for the great giveaway! Cool technique and cool ruler! I would love to give it a try and make “Festivities” which instantly caught my eye. Thanks for the chance! Awesome ruler! I love Tropics! Thanks for the giveaway . I love the bright, fun colors in Tropic. Can’t wait to try that pattern. I have made your “Open Stars” quilt. I love that pattern! Great ruler. I think timber is such a great pattern. Would be a lovely flannelquilt for wintertime. I have some jelly rolls just waiting for this ruler! I would love to try it out! I love tradewinds 🙂 Thank you for the giveaway! What a COOL process and nifty tool. I love all the quilts, but Tradewinds really stands out as one I’d love to try and have hanging on my wall. Glad I found your blog. I really like the simplicity of Parallel Universe, using colors that pop, and Festivities is fabulous as well! Of course, I like them all. Sew many possibilities but transitions is my favorite! Love all of these patterns, but I think I like Tradewinds the best!! This ruler looks amazing and I would love to win one!! I just signed up for your blog also!! I like the Festivities pattern. I think it would be great done in Christmas colors. Love the Timber pattern and I have totes full of strips that could be used..Thanks for the contest. I love parallel universe. Love it! Looks fun, fast, and beautiful. Enter me for a chance to win. oh dear…i must make paradise found!!! totally ME!!! What a fantastic ruler! I had heard about it but never seen it in action! I like the pattern Timber and have signed up for your newsletter – thanks for the tutorial. Festivities would be my favorite! Love that little ruler! Love the ‘Tradewinds’ block! How clever your family is (and talented, too!). It’s hard to choose a favorite! I love the Tradewinds and Festivities paterns. But others are great, too! Thanks for the give away. This is just incredible!! Thanks for sharing this post and the giveaway too. I really like the 1 Fish 2 Fish design. wow…LOVE that ruler. The more I read, the better I liked it. I like when such a simple concept gives you such AWESOME blocks. My favorite was the MULTIFACETED. Will you have a booth in Houston during the quilt show? I really like the Tradewinds, also Timbers. Oh, how I would love to add this to my collection, would be perfect for what I do. Thank you for the offer. Ooooh, I love the Daniela block. I think it’a a must try. Thank you for your technique! Just in case I don’t win, 😉 can I uses a squaring up ruler and get the same results? Great post! Lots of fun quilts, but Festivities is my favorite! I love tube quilts, so many different ways to use the block. I love the timber quilt. It would be fun to make this as christmas trees. Love the whole idea behind this cutting ruler. Thanks! Parallel Universe was my favorite! I would love to try the tub method with the ruler. being from florida, i would have to say that “tropics” is my favorite pattern! My quilt shop here in Kansas has Radiant displayed and I so love it. Thanks for a chance to win your gift. I love watching your videos. All the designs are nice, but I like Tradewinds the most! I had two favorites. Tropics and Transitions. Those are the ones I’d love to make if I win the ruler. Thanks! Tropics is definitely my fav! Tradewinds is my fav. I’ve always wanted to make one like that! Intertwined is my favorite. I never realized a ruler like this existed. Can’t wait to try one out. Thank you for the great explanation and the chance to win. I am intrigued by the Lotus Blossom pattern. The Festivities pattern is my favorite. Thanks! Love the Tropics pattern. Thank you for the chance to win a great rule. My favorite is Multifaceted. Great idea for the a ruler. Thanks. I love the Festivities pattern. Must try this ruler! Oh my goodness! Love the ruler and tube-way! thanks. must have, I believe. I like the Timber pattern. I would like it in fall colors or Christmas floors. Thanks for the inspiration. I love the versatility of the Strip Tube ruler! Wow! I like Tradewinds! I need this ruler, ASAP! I love your designs but my favorites are Tradewinds and Multifaceted. 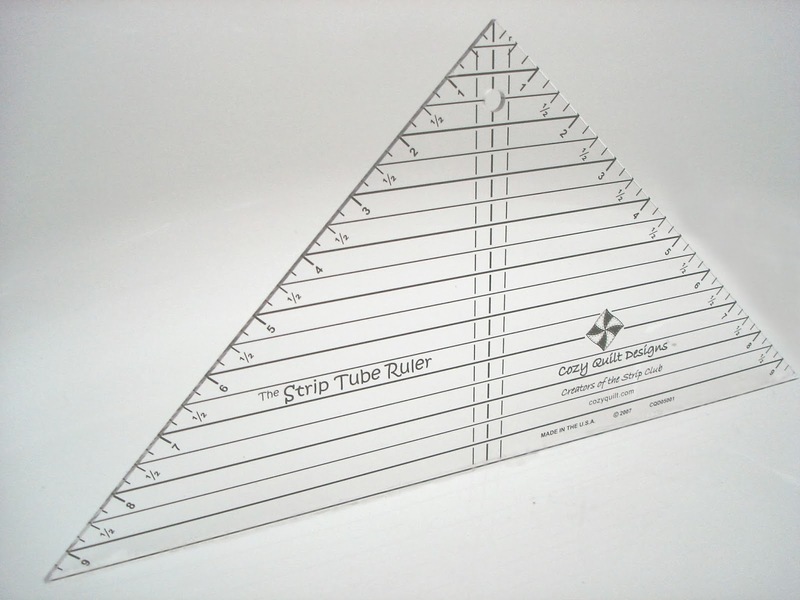 The strip tube ruler is amazing and I would love to use it. Thanks for the give-a-way. I really like the Timber quilt – with your ruler I think I could finish it by Christmas (yes, this Christmas)! Thanks for the give away! I really love Lotus Blossom. thanks so much for the chance to win. Hi: I have been getting the newsletter from Danielle for forever and I love to read it each week. I have watched some of the videos, have some of her patterns but not the ruler. I would love one! Thanks for the chance. Transitions is the one for me! I would put this ruler to good use and be ever so grateful. I love the look of Paradise Found! i really need to choose just one? Wonderful ruler! OOoooo!! I love the colors on the Tropics! Never seen a tube quilt!! I soooo want to try this. thanks for the idea!!! What a great idea. I think all the patterns are great but really am drawn to Festivities. My 10 year old daughter and I have been looking at strip piecing ideas for her to begin her patchwork and quilting journey. THIS is just perfect for her and to win this for her would be just awesome!! thank you for the opportunity. I love parallel universe, what a great pattern! Paradise Found is so beautiful!!!!!!!!! Would love to try the Parallel Universe. I think the tube ruler is one of the coolest ideas to come out! With out a doubt, Festivities. I love the pinwheels and the color choice. Thanks for the chance to win. Right now Tradewinds is my favorite, but I imagine the favorite will change depending on the mood I am in each day since they are all great. I’m glad your mom made you do it…and that you and your husband listened! I like this! I love the Lotus Blossom & the Festivities. I already have the Tradewinds pattern. Thanks for this opportunity to maybe win. I have Paper Lanterns which makes a lovely quilt in Japanese fabrics – that is my favourite pattern. I’m glad your mum made you make the ruler. I love my Strip Tube ruler ! X Factor is my favorite pattern so far. 🙂 I am making one now! I am new to your designs but I really like the “Daniela” block – it looks like spools of thread! I’d love to win this ruler and use up some of my strips!! Very clever! Love Tradewinds and Multifaceted. I own several of your patterns. Yesterday I pulled out all of my Christmas fabric which meant moving a bunch of stuff away from in front of the cabinet…now I can’t reach my patterns so I can’t tell you the names! Does anyone else play the sliding boxes game in their sewing room? I’d love to try this technique. Thanks for the chance to win this fun ruler. I love the. Pattern “Transitions”! What a handy ruler! I forgot to tell you, my favorite pattern is hanging gardens! i would make Festivities my first choice. I have seen these strip tube tutorials and it looks like fun! Love the colors in the Tropics pattern. That is one cool ruler too! I love all the patterns. I helped my mom create one of these quilts out of scraps. She has dementia and it was an easy step by step process for her. All of the patterns are beautiful! The Parallel Universe is my favorite, it’s out of this world! The rulers are great. They will make a tedious job so much easier. Thanks for being so talented! So many possibilities for a favorite! How about X-Factor. I enjoy your videos…they make me wish I lived near San Diego! It looks like you have a lot of fun! Keep up the great work! I use a lot jelly rolls in my quilts. What a time saver this would be and so accurate. I want this. Thank you! Lotus Blossom is my favorite but they are all very pretty so it was hard to choose just one. Thank You for the chance to win this ruler and for designing tools that make the art of making quilts easier. The easier it is the more fun it is. Tropics is gorgeous and calling my name. ☺ Thanks a bunch for the chance to win in your awesome giveaway! What a great post with very good information. Thank you so much. In looking at the patterns shown here in the post, I really LOVE “Paradise Found” a lot. That would definitely be my favorite. The first time I had heard of the Strip Tube is on Connie’s blog. 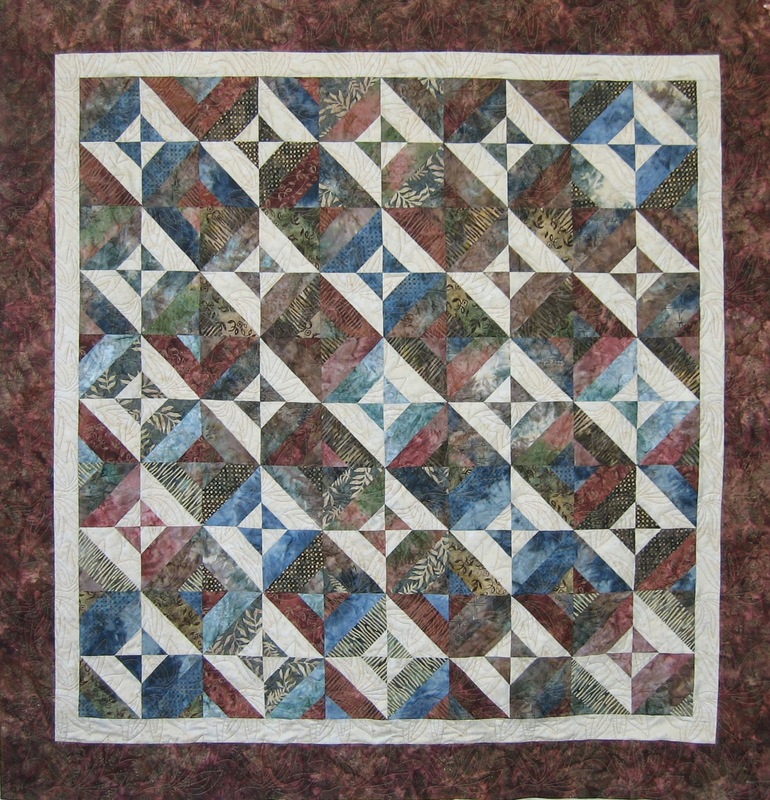 She does quite a few beautiful quilt projects using the Strip Tube. I think my favorite of hers is Neopolitan Dreamin. It’s such a beautiful quilt and layout. She does a great job showing how to create quilts and projects too using the Strip Tube. I really like both Up Square Down Square and Glory. Thanks for sharing your Strip Tube technique! What a neat concept – you are so cleaver! My favorite is Parallel Universe. Hope I win! Great ruler. Now I’m going to check out youtube for your videos. I can see this is a new must have for my studio. I have 20 grandchildren to make quilts for and am not even half way through and I love all these patterns. Thanks for sharing and for the chance to win. I love all of them but my favorite is Intertwined. It’s a 3-way tie: Festivities, Transitions, and Strip It Tube. Who would have thought there were so many possibilities? WOW – what a great ruler – would love to have one!! L love the pattern Tropics because of it’s bright, vibrant colors. We’re starting a rainy fall here and am already missing the warm weather. Your ruler is incredible! Aww…intertwined is wonderful! This ruler looks like fun! I could put it to good use! love the look that both transitions and multifaceted have, would definitely want to make both of these…. Wonderful post. Picking one pattern is such a hard decision, but i will go with Festivities. Oh my! I love how this is done! That’s great! I love the pattern that you have shown here. It looks like spools! This ruler is magic. It is the first time I have seen it. I love the blocks that it can create. Well, this was all new to me, but I am majorly intrigued! I really loved the Trade Winds quilt shown in the email. I am going to check out some of the videos. I just love new and easy techniques! Thanks for the chance to win AND the great new info! I am very very fond of Multifaceted! Thank you for the very detailed post. I’ve not yet tried this, but I might have to. I am loving Lotus Blossom. Thanks for the chance to win. Can I pick two? Lotus Blossom and Timber are a toss up! i love multifaceted. thanks for the chance to win. My favorite is the Lotus Blossom pattern. Would love to try the ruler. This is brilliant! My favorite is the “Parallel Universe” pattern. And as a side note, I used to live in Santee and visited you when you first started out! Nice to know that you’ve grown and flourished! I’m liking Timber. Thank you for a chance to win. 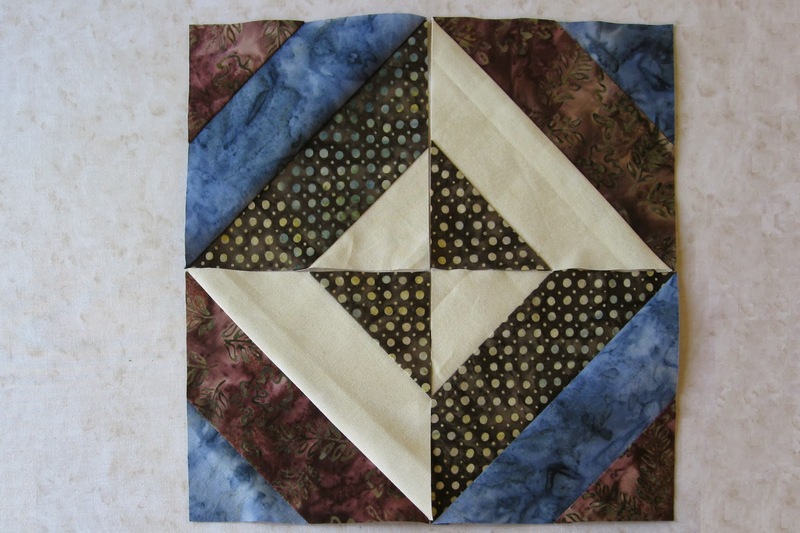 I really like the quilt you gave instructions for… and Tradewinds! Spent this past weekend at a quilt retreat and that got me inspired, but this page is getting me motivated! Hi! I just love Lotus Blossom and Tropics! I couldn’t choose just one. I would love to try out your ruler. It looks like a real time saver and it makes interesting designs! Two things that I really like! I’ve used Multifaceted. It was a great pattern! I love all of the designs Cozy has. Having the ruler would be wonderful! Oh, so you’re the one…I went to your website and notice that I do indeed have many of your patterns. Yes, I’m getting old or I can get away with saying its that my pattern stash is as huge as my fabric stash. I do like “Up Square Down Square”. Lotus Blossom is my favorite. I can just see it as the quilt in my guest room. Also, if I win, this would be a perfect project to take on retreat which is coming up fast . I would love to try “multifaceted” as it looks like something my son would ‘approve’ of for his house! I’ve never heard of the tube technique before. Fun ruler! I really like the Parallel Universe pattern that you highlighted in your post. I like Paradise Found. This ruler makes this look so simple. What a great idea. Oh, I hope I win this one. I love the Tropics pattern! I love the Parallel Universe pattern! Neat ruler and technique! I really like Timber! thank you! Fabulous ruler! I love the Entwined quilt. Looks like I need another ruler! I love all the patterns but if I HAVE to choose, I would choose Multi-faceted. This ruler is ingeneous. 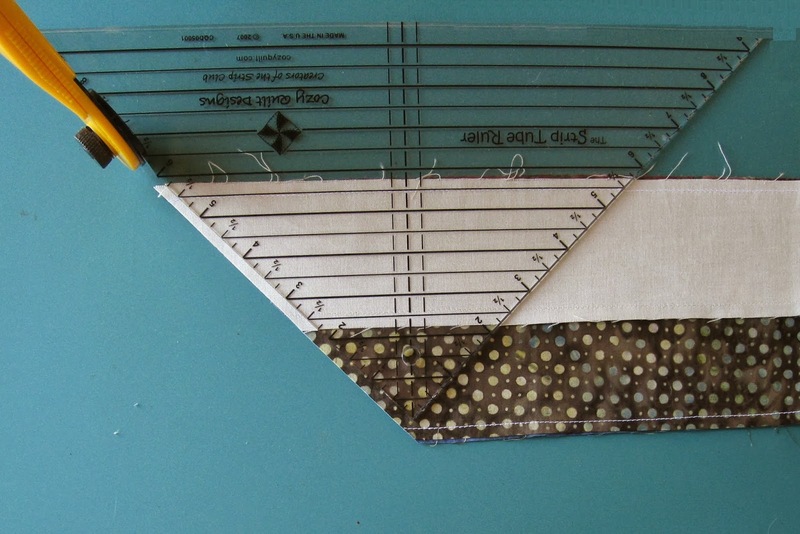 I love all of your patterns and I have been wanting to try this ruler …would be so fun to win it!!!! 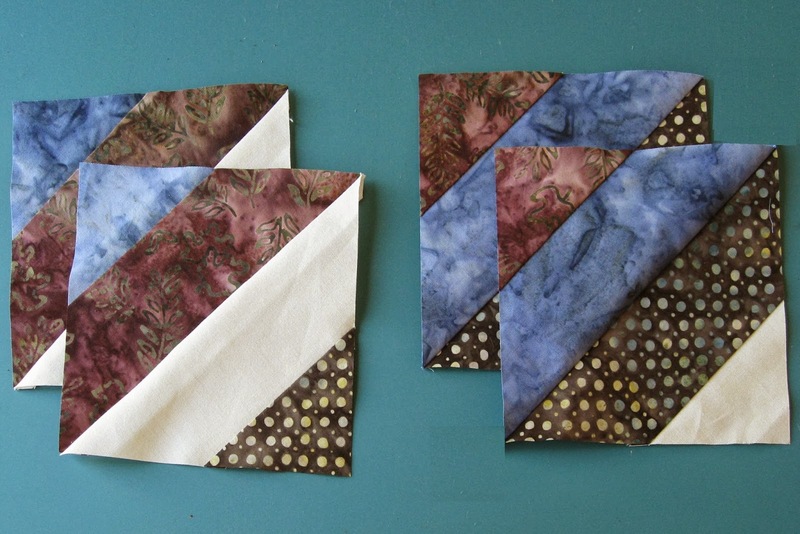 I did choose Multifaceted pattern….really like that one!Fingers crossed! I like Tradewinds and Parallel Universe! Thanks for the introduction to a nifty patchwork and design tool. I really like Tropics! Oh! I love Multi-faceted – but it was so hard to choose my favorite. I love the “Daniela” block quilt too. Thank you for the opportunity to win this awesome ruler. I love Tradewinds. I would love to win. Thanks for the opportunity! Wow, never saw so many possibilities. I need this ruler. – and a lot more time to quilt. Thanks for sharing your ideas. I like the tropics quilt. It looks so colorful. I have made Intertwined several times but I want to mkae Butterfly Blooms next. Really love Tradewinds. I do own this ruler. So if I won would give to Barb H. a new quilter and my daughter’s mother in law. Great tutorials. Cozy is my favorite quilting shop. Festivities is such a fun quilt! Transitions is so beautiful, I would love to make one. I have never seen this ruler before, sounds interesting. Thanks for this opportunity. Love the Traditions quilt. The ruler looks like you can make many different patterns from it. Several of them catch my eye, but I would probably choose Festivities. I can see it in several different fabric collections. Thank you for the giveaway and the opportunity to try this ruler. Transitions catches my eye the most. I would love to try this ruler! It put me as unknown, eventhough I signed in with my Google account. Gorgeous quilts. I’m anxious to try my hand at making some of these. They’re all great! I really love the Transitions Pattern. Thanks so much for the chance! I love Parallel Universe. My son is going off to college next year and that would be a wonderful (yet masculine) quilt to make for him. Festivities is my hands down favorite. Thanks for the neat idea and the wonderful ruler. I’d love to try it out. My favorite patterns are Star Crossed and Parallel Universe patterns. This ruler has been on my wish list, since I watched one being used at our quilt retreat, thanks for the chance to win one! I’m a slow quilter so any tools that can help me go faster are tools that I love. My favorite pattern is Tropics. I love One fish Two fish and Galaxy! Parallel universe looks like a fun pattern. Love the ruler! The one I like most right now is TROPICS! Sonora is my favorite – thanks for the chance to win. I love the Leftover pattern. It’s quick, easy and I used up alot of scraps. I like the festivities pattern, plus a lot more. I will have to get this ruler and make a quilt. Love the “Festivities” pattern. Thanks for the chance. What an amazing ruler!! Gotta get me one! Love the Transitions quilt! It would be so much easier to say which patterns I don’t like. None! Love your choices of colors too. I would really like to make Intertwined. Thanks. What a great ruler! I love Parallel Universe and Festivities. Thanks for the giveaway. What a great giveaway! My favorite quilt is Intertwined, great post! I love the Tradewinds quilt. Thanks for the chance to win this fabulous ruler! Very clever ruler! It’s hard to pick one quilt, but I think Transitions is pretty cool! What a great idea! my favorite is Parallel Universe. I think I have purchased 5 or 6 items from your recent days of education. I love all of it. Each and every day I learned something new. Thank you! Intertwined or Tropics. Can’t decide which I like the best. Great ruler! I like the simplicity of parallel universe. I can be contacted through my blog at http://www.missourimel.com if I win. Thanks! My favorite is Tropics! Thanks! I love the Daybreak pattern! This ruler looks great—thanks for the chance to win! It’s difficult to pick just one, they are all so beautiful. I have narrowed it down to three: Intertwined, Lotus Blossom, and Paradise Found. Thanks for the chance to win! Fantastic patterns. I would love to make a quilt using the Tropics pattern. Tradewinds is beautiful, but Transitions is a close second. Hard to choose just one! I love this product…I love the Paradise Found pattern and would love to make it. I really love paradise found just stunning. This makes very quick work of something that can be a headache to achieve. Thanks for the tutorial as well as the chance to win this great ruler. I forgot to tell you my favorite pattern, which would be Paradise Found. Awesomely inspiring for sure. My favorite is Transitions, but Tradewinds and Paradise Found come in close behind! Thank you for the beautiful patterns and the give away! Love the Transitions quilt. 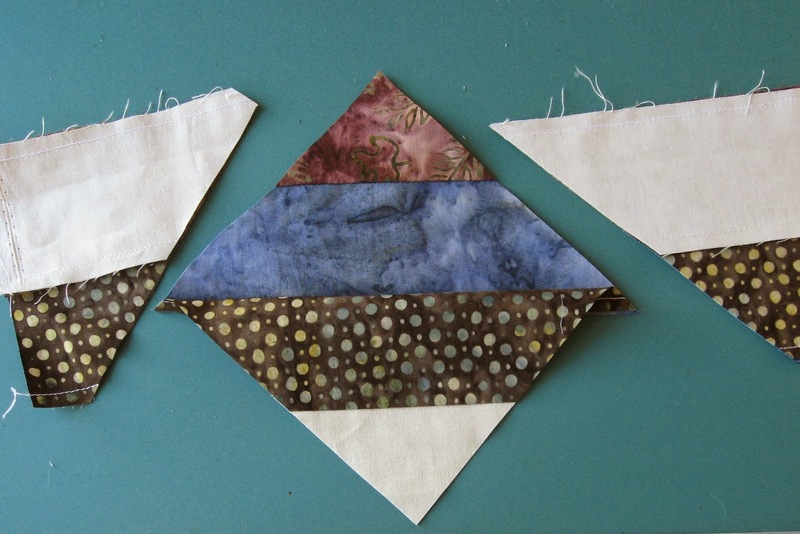 Love working with batiks and this would be gorgeous….really cool tool! Thank you so much for sharing this easy to use idea. On my way to the “room” now to use mine. Not sure how long I have had it but I think it was received as a gift for my May Birthday!! I really need to act quicker. Hopefully my name will be drawn and the USPS will not be as slow as I am in getting it to me!! Clever ruler! I like parallel universe! I love Multi-Faceted…It is beautiful. I want to say, what a great ruler and idea! I love new ideas and easier ways to do things. Daniela, I’m liking the Paradise Lost quilt. Something about it is callling my name..lol! Love the ruler and tube cutting idea. Aren’t Mom’s just great? Thanks for the giveaway. Daniela, you are even more beautiful in person! I so enjoyed visiting Cozy Quilt last month for the Saturday Fun. It seems we have also been Facebook friends for awhile. It has to be because of simply fantastic SewCalGal. I really like your Spin City pattern. Happy Fall! I really like the Paralled Universe. This IS the COOLIST thing ever!! Lotus Blossom! What amazing work. Wow hard choices. But for now parallel universe seem to keep my eye. Thanks for such wonderful inventions! I really love the Lotus Blossom quilt. Hope I win the ruler! Tropics is my favorite. I love the brights. I’d love to try one of these out. I loved the Timber and Hot Flashes. I love the tropics quilt top! It reminds me of all good things sunshiny and warm! Thanks for this post, the tube method is a great idea. I looked at your site, you have a great selection of patterns, but Hint of Fall is one I’d like to make with a charm pack and some appliqued leaves. Nice. It has to be Festivities for me. Big fan of Jelly Rolls! A must have for every quilter, what a neat idea!! I love the festivities block and can imagine so many great possibilities with this little helper you have created.. I forgot to say a huge thank you for the giveaway and showing all the beautiful patterns one can use!! Thank you!!! Tropics is what caught my eye. Great post…I’ve never heard of this ruler before. I’m off to check out your patterns. Thanks for the chance at your giveaway. Great ruler. Love Tradewinds..Will give it a try!Thanks for the chance to win too. I love to read about new rulers because when I see them in the store I have no idea what they do. Thanks for the demo! Thank you for sending us to your site to subscribe to your newsletter. I loved looking through your site. I saw many future projects I will purchasing from you. They were all beautiful. I love the Spangled pattern. Your tool is awesome. Whether I win or not I have to have one. Thank you for the chance to win one!!! Hard to choose but I really like “Transitions”! Now I am going to go check out your mom’s site.. I love intertwined. What a great idea. I’d love to try this ruler. Like the looks of Timber for a holiday quilt! They are all lovely but Paradise found is my favorite. Can’t make up my mind between Transitions and Parallel Universe, so I just might have to make both! Wow – this is very fun to learn about. I love the look of Parallel Universe, but there are several that call to me. Thanks for explaining how your ruler works! Trade winds for sure! I watched someone make it at a retreat several years ago and still think I need to get the pattern and make it – I had no idea it was easier with a special ruler! Oooo, it has to be Transitions. That one is really great! I really think all the patterns are great. I especially like Tradewinds. Oh, I have wanted to get this ruler for so long! Thanks for the chance to win one! I really love the pattern and colors of Tropics. Thanks for the information on your ruler and the giveaway. I fell in love with Transitions the first time I saw it!! I’ve loved ‘Trade Winds’ since I first saw it and still plan to make it! Paradise Found AND Lotus Blossom – beautiful! Ahh! I love Lotus Blossom! Thanks for the chance to win such a great ruler! Wow, what a concept! I can’t believe I’ve never heard of it before. I love the pattern, Multifaceted. Thanks for sharing all the great info. I love the Tropics! All of them are beautiful, though. I love the lotus blossom! I’d pick Paradise Found as my Number One favorite! Great ruler! I like the Parallel Universe pattern. Lovely! Very cool! I love Parallel Universe. Parallel Universe. What a great ruler!! I really like Parallel Universe. Thanks for the chance to win! I love Multifaceted pattern. I made with batiks for my niece. Good ruler. How awesome is that ruler! I’ve never seen it before and all your patterns are beautiful! Thanks for the giveaway! Transitions has to be my favorite with Paradise Found a very close second. Lotus Blossom is my favorite but they are all beautiful. Tradewinds is my favorite. Very versatile ruler! I love the multifaceted..looks complicated but isn’t! I love all of your strip designs and probably own about 30 of them. Tropics is my favorite, along with Christmas Cactus. This is a great post! I love all the quilts you showed, but the colors in Tropic were so bright and cheery. I have this ruler and it is great, but I didn’t think I realized the wide variety of possibilities in design until I saw all the photos of your patterns. So great! THEY ARE ALL SO GREAT, BUT MY FAVORITE IS STILL TRADWINDS.